“Gathering Places” Tour a Success! These tours, which are offered through Lyman Museum, are so much fun to research and lead. It was Judith Kirkendall who designed them and she has brought me on to help. Judith is a historian and anthropologist (her dissertation was on the anthropology of food), lived for many years all over the world, and was formerly a University of Hawai‘i dean. She is just a lovely, interesting person. I am so fortunate to be able to work with her. We have so much fun working together. 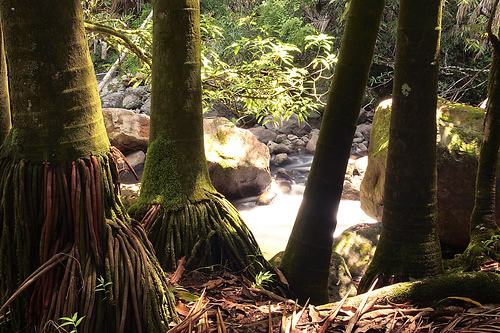 East Hawai‘i, of course, has so much interesting history, and one of the fun things about our tours is that we can sneak people into places one doesn’t ordinarily get to see. Among many other places, we went into the Kaikodo Building and up into what was formerly its very interesting Masonic Lodge to examine the architecture – even though the Center Stage Dance Studio has recently moved in there. We talked to them in advance and got permission to have a look around even though they had a class in session! It was generous of them. We heard all about the Koehnens building’s history, and even went into its basement where we got to peak into a cement channel where the Wailuku River courses underneath the store. You can see the river swooshing by! I mean, you could reach down (not too far) and touch the water! Owner Karyl Franks told us some great stories about the building, how it was built, tsunamis, and how they keep that river from flooding the place. We ate our bento lunches (included in the tour) at the Wild Ginger Inn in Wainaku, which has quite a history of its own. Its owner showed us around and told us about how it was formerly a hotspot bar/nightclub. 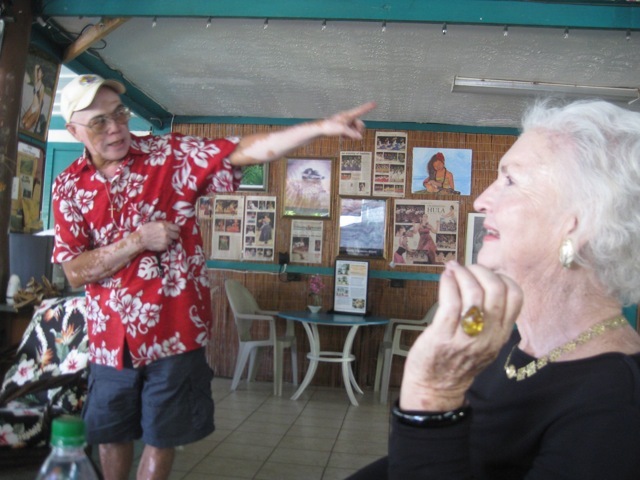 One of our tour participants recalled going there in the 1950s when a stripper from Punahou School was performing. It’s much calmer there now. There were many other stops as well – I’m just telling you some of the highlights – and then we ended up at the Japanese tea house at Lili‘uokalani Gardens, where we talked about Japanese architecture, brought over by Japanese carpenters who immigrated as plantation workers. 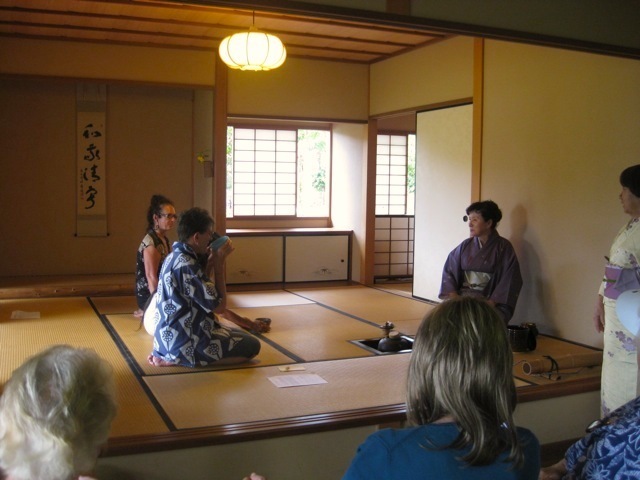 The women of the tea house put on a tea ceremony demonstration for us, and it was an absolutely perfect way to end our busy tour. I think everything seemed to leave the tea house feeling a bit more calm and centered than when we arrived there. Our next tour, also a guided van tour that starts at the Lyman Museum and runs from 9 a.m. to 2 p.m., is on Saturday, December 17th. It’s on domestic structures – or another name for it might be “Historic Homes.” Sign up for it by calling Lyman Museum at 935-5021, if you’re interested, and don’t wait ’til the last minute because we fill ’em up. And stay tuned for news about a brand new tour series, on a new topic, that we’ll be premiering starting in February. It’s going to be neat, and I’ll tell you more about it here soon. I wrote about vog recently and the article is out in the current (August 2009) Honolulu magazine. 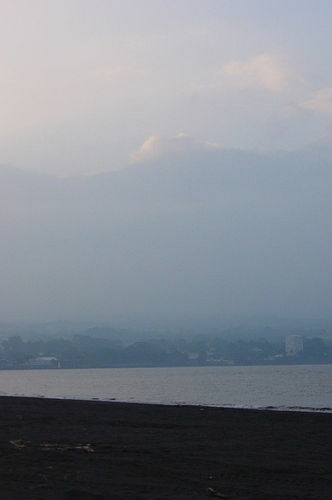 It comes on the Kona winds—the dreaded yellow-brown haze of vog that makes eyes burn and lungs protest. On the Big Island, of course, it has done far more damage. How bad could it get? 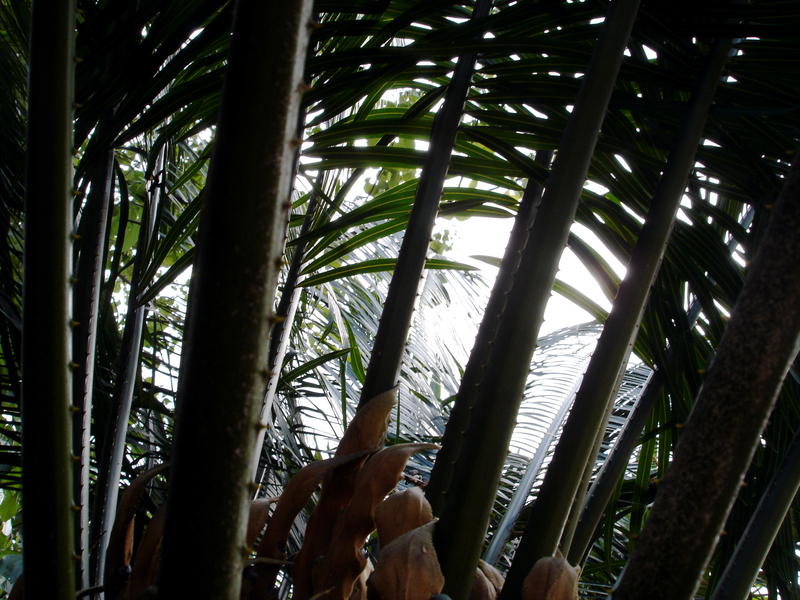 And what do we really know about vog and its effects? Three-thousand, eight-hundred people lived on Miyakejima, a small island off Tokyo, until one day in September 2000, when the Japanese government ordered the island evacuated because of extreme volcanic activity. As directed, people delivered their pets to the port by 9:30 a.m., packed some belongings and a lunch and then boarded a city bus for the ship. That was some pretty extreme vog they had there. When researching this article, I learned that our Big Island vog — when it was at its worst last summer — was only a tenth of what they experienced on Miyakejima. The lesson? I don’t know what the lesson is. But remember this: It could actually be worse! It’s hard to remember when our air looks so thick it seems you need to push your way through it with your hands. Local excursion #2 of our Summer of Exploration was a slow, winding drive down the four mile, scenic route that diverts from the highway and runs along the coast, more or less, between Pāpa‘ikou and Pepe‘ekeo. This used to be the main road, I told my little girl. This is the way people used to go to get to Hilo town a long time ago, I said, and we talked about how the road is smaller and much more winding, and how they must have driven much slower than we do now. I told her that what’s now Highway 19 used to be railroad tracks, where trains ran up and down the Hāmākua coast carrying sugar from the sugar mills to the harbor, where the big sacks of sugar were put onto ships and sent to the mainland. “To California!” she piped up. Yes. And also people rode on the train, I told her, and we talked about how there were railroad stations up and down the coast where you got on and off the train. I told her that when my grandmother, “Tutu,” was her age, she used to take the train to go to town with her mother. We both thought about what a different time that was. At least to my eyes, it is still a bit of a slower, older time along that four mile drive. I like it. It is quiet there — and while certainly there are probably people along that route living busy, 21st century lives, you don’t see much of that from the road. Mostly you see families living in houses where there families lived for a long time before them, eating fruit from the same trees their grandmothers picked to make jam, playing in the streams. “Papa’s grandparents were married in that church,” I tell my daughter every time we pass the little church near the Pāpa‘ikou end of the scenic route. Once when we visited new friends near there, we learned that the woman was the priest’s daughter. She recognized my husband’s name and showed us his grandparents’ names in the book her father had kept his records in. I donʻt know why I feel compelled to tell that to my little girl every time we pass, but I find that I do. Someday, when she looks at that church, she will think about that. Maybe she already does. It will be one more place she has a small connection to, and two people who came before her might feel a little bit more real. I told my daughter about the Onomea Arch — a rock formation over Onomea Bay that you used to see from the road, until one day when it fell and was no more. Some artists painting it nearby saw it go. Lots of things are gone now. But while we live and enjoy our lives here in the present, with what’s here right now, we will remember some of them and take them with us into the future. We live on the Hamakua coast, a little ways outside of Hilo, and almost every time I drive into town I think about my grandmother, my Tutu, telling me offhandedly once that her great-grandfather had known every twist and turn of that road. Even when he was in his 80s and 90s and fully blind, she told me, he knew where he was by the turns and feel of the road, and he would call out the name of every small bit of land as they drove by. In the old times from which he came, place was so important, and every small area of land was known and labeled. Things have changed for most of us; I mostly just know “Papaikou,” “Ka‘ie‘ie,” “Pauka‘a,” and a handful of other place names still marked by signs or street names. But there are, of course, so many more places with their own names and characteristics and stories. Tutu told me about this one day long ago. It was when we passed a place she told me Kamehameha Schools had considered, before deciding to build their Hawai‘i Island campus at Kea‘au. At that time, they were using the old Hawaiian name for the potential Hamakua site, one that hadn’t been used for a very long time. “I hadn’t heard that name in absolutely decades,” Tutu told me — not since the 1920s and early 30s when her great-grandfather Nalimu had ridden that route and named every individual place along the way. I wish we could ride along with Tutu Nalimu, and hear and learn all the names. I want my daughter to know about this place where she lives, including the Hawaiian names and their stories. We’ll have to find a book or an old map that shows us the names, and talk to people who might know, and look up some of the old stories. I’m going to start working on this now as part of our Summer of Exploration. Currently Macario works as a photographer; see his website here. He also runs an online magazine called Macario’s Big Island. 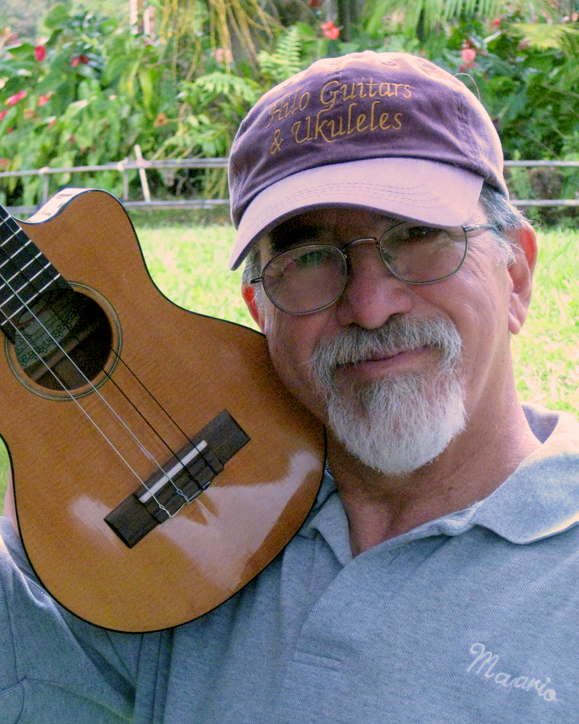 To enroll in Macario’s five-week Beginning ‘Ukulele class, call the East Hawai‘i Cultural Center at 961-5711. The East Hawai‘i Cultural Center is located at 141 Kalakaua Street in Hilo. Edited on 4/21/09 to add: And an earthquake, too! My visiting friend is having the full Big Island experience. From the USGS: A light earthquake occurred at 4:58:09 PM (HST) on Tuesday, April 21, 2009 . The magnitude 4.2 event occurred 7 km (4 miles) NNE of Ka`ena Point. I have a dear friend visiting from the mainland, and today there is big time vog here in Hilo. It look as if you might have to push through the voggy air with your hands in order to walk. I feel terrible when a friend is visiting our lovely, usually sparkly town and Hilo puts on her all-time ugliest dress. 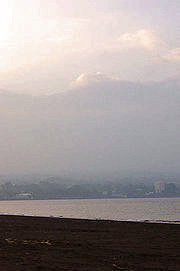 Volcanic fog. It’s stuff that can make your eyes burn and that you can taste in your throat. It can be a huge problem for people with asthma or other respiratory problems. I have a cold right now and I feel the vog in my lungs; fortunately, this will pass. Thank goodness it is not usually like this. Hilo is truly one of the prettiest cities I’ve ever seen. It rains a lot and then it sparkles, and is blue and green in all the right places. The water shimmers. And the gentle tradewinds generally whisk away all the bad stuff, leaving us with air that is crystal clear. What’s a person to do? We went for a long walk in Lili‘uokalani Park anyway, and pretended we could see clear to the other side. The trades will come back and the air will clear, and soon everything will be all right again. Tomorrow is another day. Aunty Dottie Thompson and George Na‘ope, together credited with starting Hilo, Hawai‘i’s Merrie Monarch Festival 46 years ago, are both looking frail this year, and both attended the festival briefly on the final night in wheelchairs. Still, one can always count on Uncle George to look absolutely resplendent. Splendid or dazzling in appearance; brilliant. Splendid. Dazzling. Brilliant. He definitely still shines. Because I like multi-tasking, I will again be tweeting live from the Merrie Monarch tonight (Fri. April 17th) during the Kahiko competition. Follow me at @LeslieLang, or follow #merrie. Off I go to pick some orchids for my hair! We’re leaving for the Edith Kanaka‘ole Stadium soon. One of my many hats has me, along with Kris Bordessa, operating the website Big Island On The Cheap, a place for all things free/cheap/discounted on the Big Island. 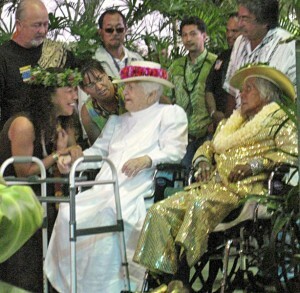 And right now, in honor of Merrie Monarch week, we have some contests going on. All you have to do is follow the links to the contest posts, and then enter your name in comments there to possibly win one of our random drawings. 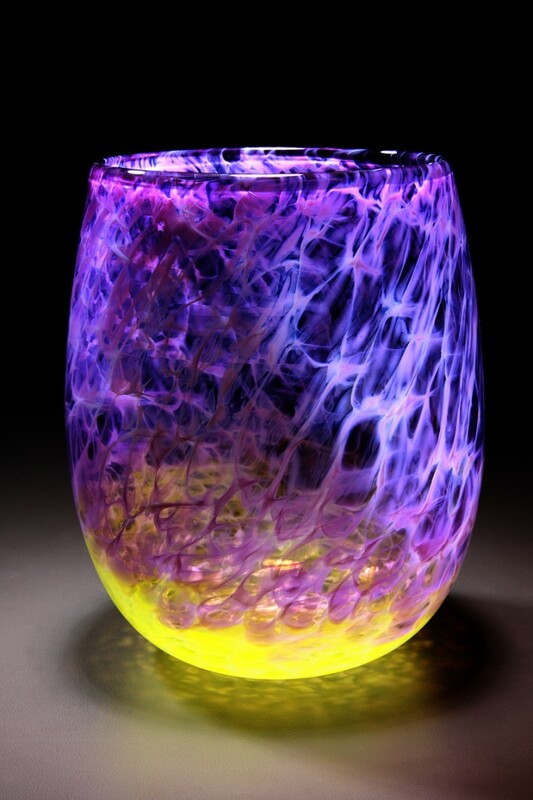 We are giving away a beautiful, and I do mean beautiful, hand blown glass vase from the Volcano glass studio 2400 Fahrenheit. Macario has a photo essay up on his online magazine right now about the 2400 Fahrenheit people. It’s lovely. See it here. We’re also giving away the computer scrapbooking program Digital Scrapbook Artist – and if you don’t win, we also have a 15 percent off discount code for you to buy your own copy. You may rest at night because I give you my personal word that when you enter, we only use your email address to contact you if you win. No shenanigans there. 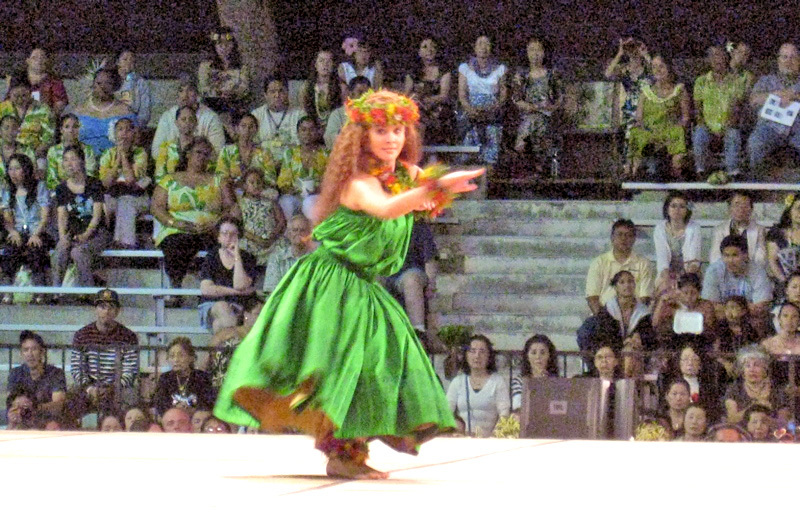 And if you do mosey on over to Big Island On The Cheap, remember that it’s Merrie Monarch week over there and we have all sorts of Merrie Monarch special features. 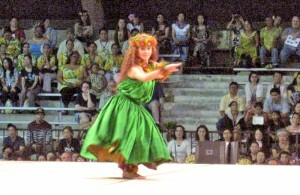 Enjoy the magic of the hula festival vicariously! See you there. Both contests end at midnight, Hawai‘i time, on Saturday, April 18th.